Those of you who read Part I of this article already know that 王羲之 (Wáng Xīzhī, 303–361) was quite a character. There are many amusing anecdotes about him, his life and his relatives, mainly his son Wáng Xiànzhī (王献之, 344 – 386 C.E. ), who will be discussed in a separate article in the near future). I chose some of the most renowned stories and will share them with you in this part of the series of articles on this great calligrapher. Figure 1. 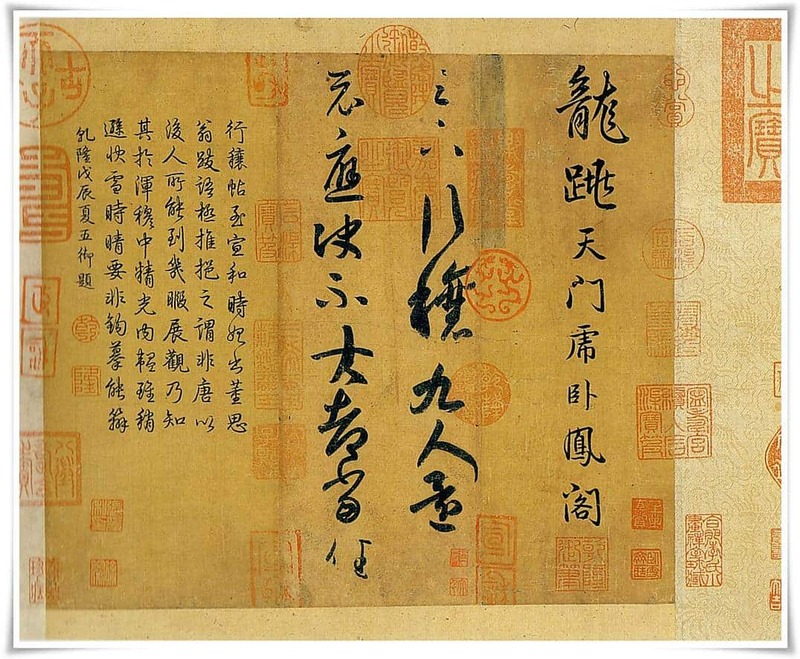 Elegant yet vigorous copy of the original letter by Wáng Xīzhī, entitled 行穰帖 (Chinese: Xíng Ráng tiē). This particular copy was written in early Tang dynasty (唐朝, 618 – 917 C.E. ), the original work of Xīzhī did not survive. Ink on paper, main text (15 characters): cursive script (草書, そうしょ, sōsho), explanatory notes are written in semi-cursive script (行書, ぎょうしょ, gyōsho). Wáng Xīzhī, like many calligraphers, was absent minded, and when completely immersed in his studies, he tended to forget himself. One day, he left his studio, called by his wife. She was quite surprised to see that his mouth has had turned black, and asked him what had happened. He replied that he must have dipped a biscuit in the ink, thinking that he was holding a brush, then tried to eat it by mistake. The first time I read this amusing story I laughed even more when I realized that a very similar thing had happened to me. The other day when I was studying rinsho (臨書, りんしょ, i.e. “copying masterpieces”), I had a small plate full of dark chocolates set on a table in front of me. I was nibbling on them unconsciously whilst studying the brush strokes of a masterpiece that I was working on, and my hand mistakenly reached for the ink stick instead of the chocolate! Figure 2. Small fragment (approximately 1/14th of the whole text) of the copy of the primary scriptures on Taoism, entitled 黃庭經 (Chinese: Huáng ting jīng), attributed to Wáng Xīzhī. There is another story related to biscuits. Wáng Xīzhī was very fond of them, and liked to eat them while studying. At the young age of twenty, he was invited by the well-known minister and Emperor’s advisor 郄鉴 (Xì Jiàn, 269 – 339), who was searching for a son-in-law for his charming daughter. All of the interviewed candidates were nervous and tense facing such an opportunity and honour… with one exception. Wáng Xīzhī was sitting down in the eastern wing of the house on a couch, in robes undone on his chest, due to extreme heat on that day, writing calligraphy with one hand and hastily eating biscuits with the other. Xì Jiàn immediately liked the nonchalant and natural personality of young Xīzhī, and chose him for his son-in-law. Looking from the historical perspective, it was a wise choice indeed. Since that time, the coined phrase 東床快婿 (Chinese: dōng chuáng kuài xú, lit. “clever son-in-law of the eastern couch”) is used in China as a synonym for son-in-law. Figure 3. Character 鵞 (が, ga, ie. “goose”) executed in one stroke, attributed to Wáng Xīzhī. 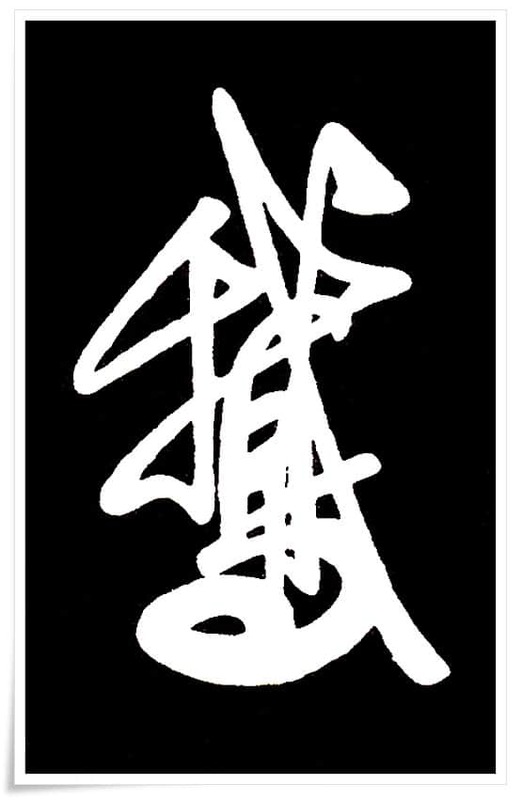 It is said that Wáng Xīzhī was the first calligrapher who wrote one stroke 鵞, and that many others modelled themselves on this character, when creating one stroke cursive forms (草書, そうしょ, sōsho) of other characters. Nearly every great calligrapher had the nature of an eccentric. Xīzhī was no exception. He loved geese. He even built a pond in front of his house for them, and had his two-character calligraphy “goose pond” (鵞池; Chinese: é chí) engraved on a huge stone and mounted near it. Many calligraphy styles and theories were developed by observing nature. Possibly this is why we find calligraphy so beautiful and rich in content. There is a saying that the three most important things in studying calligraphy are: concentration and positive attitude, diligent studies of masterpieces, and close contact with nature. How very true. It is said that Xīzhī’s peculiar technique of operating the brush, more precisely twisting the wrists while writing, came from observing the movement of the necks of his beloved geese. Perhaps, to some extent, we owe it to the geese that today we have a chance to marvel at the outstanding quality of Xīzhī’s brush strokes, even though those works are only copies of the originals. The geese obsession goes much further. Xīzhī often wrote calligraphy in exchange for a goose he particularly liked. This is how a famous copy of the primary scriptures on Taoism entitled 黃庭經 (Chinese: Huáng ting jīng) came to life. It was written in standard script (楷書, かいしょ, kaisho) in exchange for … two geese. The text is commonly used today for practicing regular script. I remember studying it myself and most likely I will be returning to it in the future. Figure 4. Outstanding 連綿体 (れんめんたい, renmentai, i.e. “connected stroke”) technique. The 行気 (ぎょうき, gyōki, i.e. “moving spirit”) in this ten characters long text is simply mind blowing. 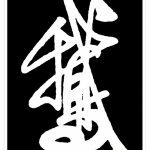 Wáng Xīzhī was famous for one stroke characters, or one stroke phrases, so called 一笔書 (Chinese: yī bǐ shū, i.e. “one stroke calligraphy”). 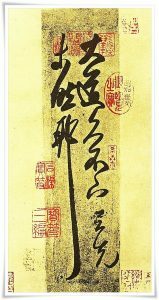 The calligraphy is entitled大道帖 (Chinese: dà dào tiē), ink on paper, cursive script (草書, そうしょ, sōsho). 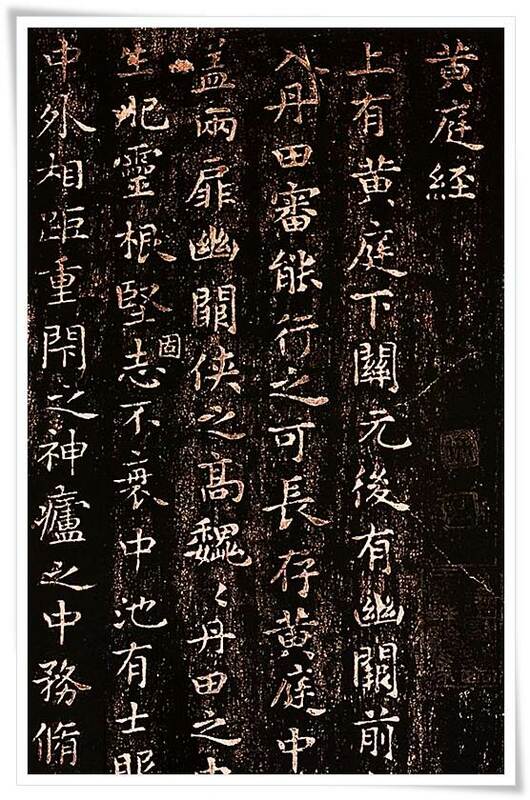 The power of Xizhi’s calligraphy is legendary. Some tales, even though they seem unrealistic, prove how cherished his works really were and how much his talent was respected. It is a great honor and privilege for a disciple to have a visit to his home from his Master. If the Master honors the disciple by arranging to make such a visit, the disciple always accompanies his Master back home. One day when Xīzhī was visiting one of his disciples, he noticed a new freshly polished table, and could not resist writing on its top with a brush. Naturally the disciple was thrilled. He then left the house in high spirits accompanying his Master to his house. When he returned, he realized that his father, who found his brand new table covered in writing, had ordered a carpenter to re-polish its surface. It really depressed the disciple after he came home and saw that the calligraphy of his Master had disappeared. But when he cleared the top of the table off of the wooden debris in anger, to his astonishment, the calligraphy was still visible. Wáng Xīzhī’s powerful technique penetrated the table “three millimetres into the wood.” Today, the famous phrase 入木三分 (Chinese: rù mù sān fēn, lit. “three units into the wood”) is a common idiom used to define something powerful and profound. It also describes a calligraphy written in a forceful manner, penetrating both the paper, and the hearts of the viewer. Calligraphy is a child of the soul. Knowing the life and the personality of an artist behind the brush, one will surely enjoy masterpieces of such an artist on a different and elevated level. In following parts of this series of articles, I will be introducing masterpieces of Wáng Xīzhī, beginning with the “Preface to the Poems Composed at the Orchid Pavilion” (蘭亭集序, Chinese: Lántíngjí Xù).